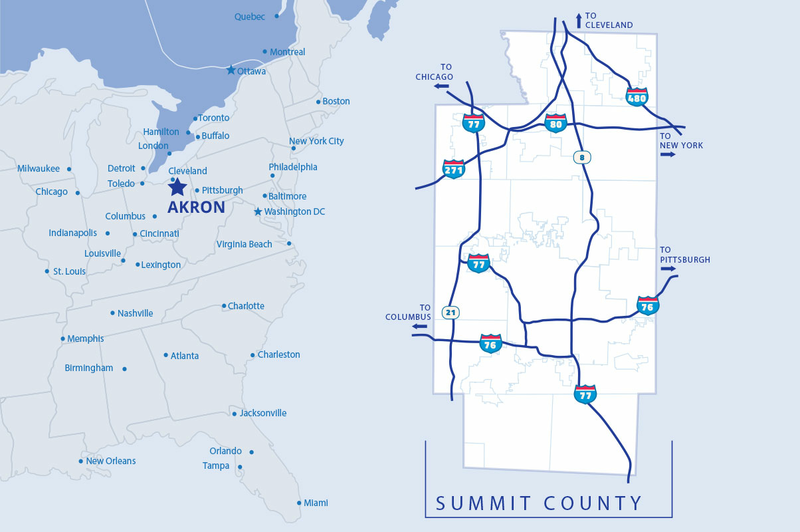 Summit County is home to some of the nation’s oldest and most respected employers. Companies like Goodyear, Bridgestone, GOJO and FirstEnergy have chosen to make and keep their home here because our region has the 16th largest metropolitan labor market in the U.S., along with access to a highly educated and skilled workforce. Our innovative mindset has enabled our economy to grow and diversify, moving from the "Rubber Capital of the World" to a center for polymers and advanced materials, biomedical research and development, advanced manufacturing and much more. Proud of our history, but focused on the future, Summit County is progressive, inclusive, and full of the creative drive necessary to succeed in a modern world. Our community is defined by the character of our people, by their warmth, openness, compassion, and vision for making Summit County the best place to live, work, start a business, and grow. We invite you to join them and move forward with us. Schedule a visit to experience Summit County. Quality of life is about more than earning a living. While we have abundant job opportunities, that is not the only reason to move here. We believe in creating the opportunity for all our residents to build a life that is enjoyable and worth living. That’s why we place a strong emphasis on inclusivity, entertainment, recreation, education, and access to outdoor spaces.